FIREWORKS #66 sees our full colour glossy pages making their way overseas as we become available in the USA for the first time! There's plenty to keep fans of great music happy wherever they live, with Godsmack talking up their brand new album. Also with new material out are Flying Colors along with a real return to form from British rockers Ten. Another British group, the legendary Status Quo talk about their unexpected acoustic album while Richie Kotzen walks us through the essential collection of his work outside of the Winery Dogs. Fans of our in depths reviews will be reassured to know we haven't sacrificed there either, with over 150 brand new releases reviewed, along with the cream of reissues, DVDs, books and EPs. Can’t find a copy? For a full list of participating stores check the store finder here at Rocktopia. 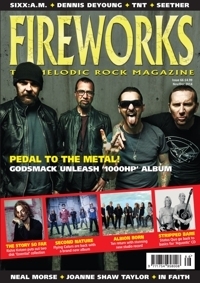 Alternatively, purchase direct from Rocktopia in the Fireworks Magazine Mini Shop. Subscriptions available there also.